It’s important homemade food for dogs is “complete and balanced,” meaning it meets all of the dog’s nutritional needs. It is not important, however, that every meal be complete and balanced, unless you feed the same meal every day with little or no variation. Home-prepared dog diets that include a wide variety of foods fed at different meals rely on balance over time, not at every meal. Similar to the way humans eat, as long as your dog gets everything he needs spread out over each week or two, his diet will be complete and balanced. Don’t bother trying to make every single one of your dog’s meal nutritionally complete; as long as he’s receiving what he needs over a week or two, he’ll be fine. This approach is similar to how we feed ourselves and our families. A human nutritionist would never expect someone to follow a single recipe with no variation, as veterinary nutritionists routinely do. Instead, a human would be given guidelines in terms of food groups and portion sizes. As long as your dog doesn’t have a health problem that requires a very specific diet, making your own dog food should be the same way. Keep in mind that puppies are more susceptible to problems caused by nutritional deficiencies or excesses than adult dogs are. Large-breed puppies are particularly at risk from too much calcium. Following are guidelines for feeding a raw or cooked home-prepared diet to healthy dogs. No single type of food, such as chicken, should ever make up more than half the diet. Except where specified, homemade food for dogs can be fed either raw or cooked. Leftovers from your table can be included as long as they’re foods you would eat yourself, not fatty scraps. Meat and Other Animal Products: Should always make up at least half of the diet. Many raw diets are excessively high in fat, which can lead to obesity. Another potential hazard of diets containing too much fat: If an owner restricts the amount fed (in order to control the dog’s weight) too much, the dog may suffer deficiencies of other required nutrients. Unless your dog gets regular, intense exercise, use lean meats (no more than 10 percent fat), remove skin from poultry, and cut off separable fat. It’s better to feed dark meat poultry than breast, however, unless your dog requires a very low-fat diet. Raw Meaty Bones (optional): If you choose to feed them, RMBs should make up one third to one half of the total diet. Use the lower end of the range if you feed bony parts such as chicken necks and backs, but you can feed more if you’re using primarily meatier parts such as chicken thighs. Never feed cooked bones. Read a full report on raw meaty bones here. Boneless Meat: Include both poultry and red meat. Heart is a good choice, as it is lean and often less expensive than other muscle meats. Fish: Provides vitamin D, which otherwise should be supplemented. Canned fish with bones, such as sardines (packed in water, not oil), jack mackerel, and pink salmon, are good choices. Remove bones from fish you cook yourself, and never feed raw Pacific salmon, trout, or related species. You can feed small amounts of fish daily, or larger amounts once or twice a week. The total amount should be about one ounce of fish per pound of other meats (including RMBs). Organs: Liver should make up roughly 5 percent of this category, or about one ounce of liver per pound of other animal products. Beef liver is especially nutritious, but include chicken or other types of liver at least occasionally as well. Feeding small amounts of liver daily or every other day is preferable to feeding larger amounts less often. Fruits such as melon, berries, bananas, apples, pears, and papayas can be included in your dog’s food or given as training treats. Eggs: Highly nutritious addition to any diet. Dogs weighing about 20 pounds can have a whole egg every day, but give less to smaller dogs. Dairy: Plain yogurt and kefir are well tolerated by most dogs (try goat’s milk products if you see problems). Cottage and ricotta cheese are also good options. Limit other forms of cheese, as most are high in fat. Fruits and Vegetables: While not a significant part of the evolutionary diet of the dog and wolf, fruits and vegetables provide fiber that supports digestive health, as well as antioxidants and other beneficial nutrients that contribute to health and longevity. Deeply colored vegetables and fruits are the most nutritious. Starchy Vegetables: Veggies such as potatoes, sweet potatoes, and winter squashes (including pumpkin), as well as legumes (beans), provide carbohydrate calories that can be helpful in reducing food costs and keeping weight on skinny and very active dogs. Quantities should be limited for overweight dogs. Starchy foods must be cooked in order to be digestible. Leafy Green and Other Non-Starchy Vegetables:These are low in calories and can be fed in any quantity desired. 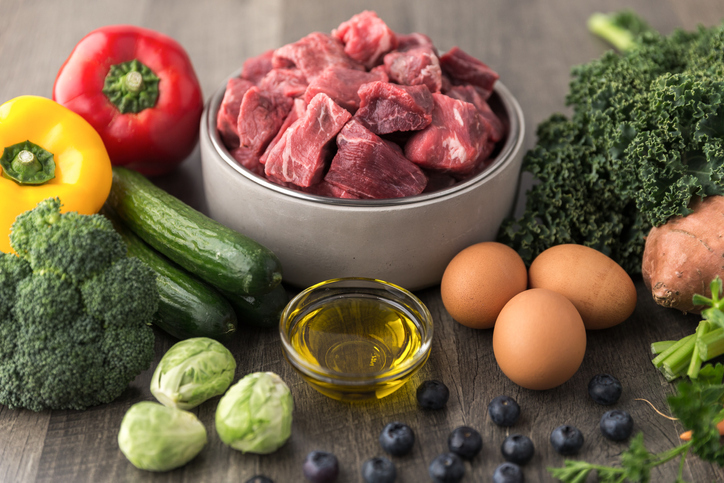 Too much can cause gas, and raw, cruciferous veggies such as broccoli and cauliflower can suppress thyroid function (cook them if you feed large amounts). Raw vegetables must be pureed in a food processor, blender, or juicer in order to be digested properly by dogs, though whole raw veggies are not harmful and can be used as treats. And while you’re preparing these nutritious foods for your dog, consider boosting your own health by adding more veggies to your diet too! Fruits: Bananas, apples, berries, melon, and papaya are good choices. Avoid grapes and raisins, which can cause kidney failure in dogs. Grains: Controversial, as they may contribute to inflammation caused by allergies, arthritis, or inflammatory bowel disease (IBD); as well as seizures and other problems (it’s not clear whether starchy vegetables do the same). Some grains contain gluten that may cause digestive problems for certain dogs. Many dogs do fine with grains, however, and they can be used to reduce the overall cost of feeding a homemade diet. Grains and starchy veggies should make up no more than half the diet. Good choices include oatmeal, brown rice, quinoa, barley, and pasta. White rice can be used to settle an upset stomach, particularly if overcooked with extra water, but it’s low in nutrition and should not make up a large part of the diet. All grains must be well cooked.